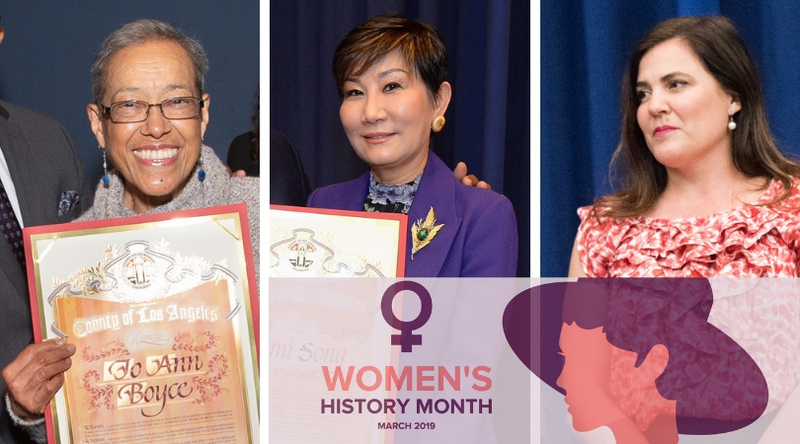 Throughout Women’s History Month, Supervisor Mark Ridley-Thomas recognized standout female trailblazers from throughout Los Angeles County including Jo Ann Boyce, Mimi Song, and Michele Siqueiros. In celebration of Women’s History Month Supervisor Mark Ridley-Thomas presented a scroll to Jo Ann Boyce, who was one of 12 black teenagers in 1956 that would become known as The Clinton 12. She and 11 others were the first to integrate a public high school in the South after the U.S. Supreme Court’s 1954 ruling in Brown v. Board of Education. “Jo Ann Boyce has been a true trailblazer for women’s rights and desegregation,” said Supervisor Mark Ridley-Thomas. Jo Ann Boyce was born Jo Ann Crozier Allen September, 1941 in the small riverfront town of Clinton in East Tennessee. She and her family lived in a primarily African American community where family, church and school were the foundations of the neighborhood. Jo Ann’s first school years were first through eighth grade at Green McAdoo Elementary, a two room all black school. As well as segregated schools, she and her family lived under the laws of Jim Crow. Jo Ann and her school mates were bussed 20 miles to an all black middle and high school on graduation from eighth grade. In the early 1950’s, several African American families in Jo Ann’s community filed a lawsuit against the Anderson County Board of Education. The lawsuit was filed to force the desegregation of Clinton High School which was in close proximity to the black community. Then, African American children were forced to be bussed to high schools in other towns/counties at a cost to the parents. The lawsuit was denied by a federal judge. However, after the Supreme Court’s ruling in the Brown v Board case in 1954, which outlawed school segregation, the same judge had to reverse his original ruling. Therefore, in August, 1956, twelve African American students, eligible for high school admittance, including Jo Ann Allen, met in front of their previous elementary school. There they held hands and a prayer was said for God’s Grace to keep them safe. The twelve then walked the short distance down the hill from their community toward the all white Clinton High School into the unknown of a new frontier. Desegregation of Clinton High School was originally met with quiet resignation or white citizens were following the “law of the land.” Within three to four days, the quiet was changed by the appearance of a rabble rouser, an outsider. Young people now held up anti desegregation signs, large crowds began to gather, Jo Ann and her fellow black classmates were accosted by foul, racist epitaphs, rotten food, rocks and sticks whizzed by this heads, spittal barely missed their faces/bodies. Over several days, racial strife worsened with acts of harassment and threats of bodily harm inside the school. Thumb tacks in desk seats, ink in lockers, destroyed books, hair pulling and heels being stepped on were frequent acts of violence inside the school. Outside school, the violence escalated to include the vicious beating of a white minister who had escorted the black students to school one day and during the Memorial Day holiday, rioting in the town which included the cars belonging to unsuspecting African American travelers driving through the town on the main highway leading to other towns, being rocked side to side, windows being smashed and lives being threatened. Overwhelmed , the extremely small police department called on volunteers of which 40 men came forward. But they too were overwhelmed by a crowd of 2-3 thousand, so help from the governor was requested. The Tennessee State Troopers were first to arrive followed shortly by the Tennessee National Guard. Although order was restored, Jo Ann’s parents made the decision to move away from Clinton following this severe breakdown in lawfulness. Jo Ann, her parents, sister and brother arrived in Los Angeles in December, 1956. She enrolled in and graduated from Dorsey High School in 1958. Following graduation, she enrolled at Los Angeles City College where she received an AA degree as well as a degree in nursing. Initially working at Good Samaritan Hospital working with adults, Jo Ann eventually was employed in her “dream job” as a pediatric registered nurse, first with a private pediatrician for ten years followed by a thirty year employment at Childrens Hospital Los Angeles until her retirement. In celebration of Women’s History Month, Supervisor Mark Ridley-Thomas presented a scroll to Superior Grocers chairwoman and CEO Mimi Song. “On behalf of the entire Board of Supervisors, I commend Mimi Song for a stellar career in the business and retail grocery industry field, and for being a role model for women in all walks of life,” Supervisor Ridley-Thomas added. Song founded the first Superior Grocers store in 1981. It has since become the largest independently-owned chain of grocery stores in Southern California, with 45 stores employing approximately 4,500 employees. Song founded the nonprofit foundation, Community Re-Engineering Inc., in 1995 to assist local programs geared at helping youth thrive. Through annual golf tournaments, the foundation has been able to raise and donate over $1.5 million to local schools in the communities they serve. In 2011, Superior Grocers was the recipient of Unified Grocers’ “Ben Schwartz Retail Grocery Visionary Award” for leadership and innovation in the retail grocery industry. In celebration of Women’s History Month, Supervisor Mark Ridley-Thomas presented a scroll to Michele Siqueiros, the president of The Campaign for College Opportunity. As president of The Campaign for College Opportunity, she works daily to expand college access and help California students achieve success. Under her leadership, she has strengthened the campaign by raising more than $21 million, championing major budget appropriations, and securing historic higher education legislation. She continues to produce reports addressing issues such as the lack of diversity among college leaders and faculty, the powerful return on investment for spending by the state in colleges and universities, the need for major improvements to close ethnic gaps, as well as reforming remedial education at colleges. Siqueiros graduated from Pitzer College with a Bachelors of Arts degree in Political Science and Master of Arts degree in Urban Planning from the University of California, Los Angeles. Siqueiros was appointed in 2019 by Senate Pro Tem Leader Toni Atkins to the Student Centered Funding Formula Oversight Committee — a committee charged with making recommendations to the Legislature and the Department of Finance on higher education related measures.